In recent years golf has begun gaining popularity in the region and some of the best golf courses in Vietnam have been designed with the assistance of golf’s premier architects like Greg Norman, Nicklaus, Colin Montgomerie or Nick Faldo. In HCMC where lots of golfers are working or living, there are several exciting, challenging golf courses within easy reach of the city centre. 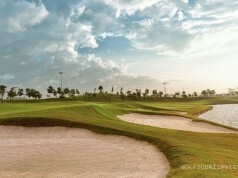 One of the best golf courses in Saigon is Vietnam Golf & Country Club. Located at a distance of 17 kilometres from the heart of Ho Chi Minh City and can be easily accessed in just 30 minutes, it’s one the most played golf courses in Vietnam as this is the nearest golf course to the city. Vietnam Golf & Country Club is one of the most prestigious and best golf courses in Vietnam, being host to many of the Vietnam Masters and Asian Tour events. 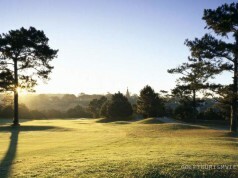 The course lies amid dense green plantation, being carved out of the existing native woodland with minimal land movement, leaving you feel that the golf course has been there for a very long time reflecting the designer’s philosophy of attuning the layout and design to the natural lie of the land. The 36-hole course has two 18-hole length golf courses that are designed and created in accordance with the best international standards, this golf course is a real challenge even for some of the most experienced players. The Taiwanese-designed West Course first opened in 1994, it measures 6,835 yards from the longest tee. The West Course is long and has greens that are so fast that you have to hold your putter over the ball and hit it with the shadow, it’s a tough test for your golf skills. 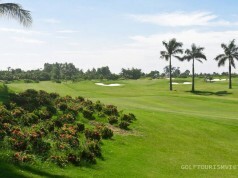 The Par 72 Championship Course hosted the Vietnam Open (Asian PGA Tour Event) in both 1995 and 1997. Lee Trevino, six-time Major Champion designed the East Course which opened three years later than its “Western cousin”. The East Course which measures 6,922 yards, is just as tough or probably tougher with more generous fairways than the West Course, you find that you are faced with many bunkers and water hazards that will trap your balls every time and Bermuda TifDwarf greens that will test the very best of putting styles. To score well on this course, a player must play smart and set up a good approach shot which will give him a relatively straight putt – which is something easier said than done on these greens. Whichever course you decide to take, we guarantee that you won’t forget the golfing experiences here for a very long time. The trick is to tee off as early as 6 am if possible as sunrise in HCM begins around that time. This helps to beat the heat as well as the traffic. If you’re planning on visiting Ho Chi Minh, for golf or otherwise, Vietnam Golf & Country Club is a smart choice for both serious and recreational golfers.